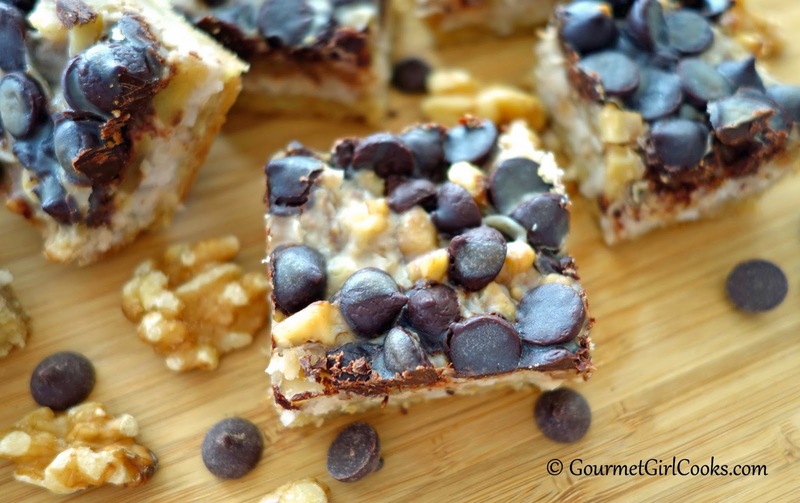 I made a batch of my Magical Cookie Bars to have on hand for dessert this week. 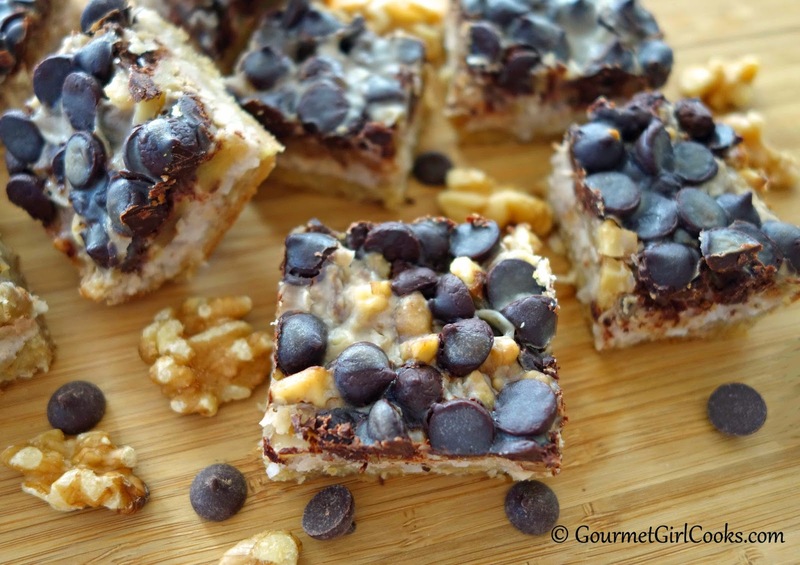 These are the "real deal" beginning with a buttery crust and topped with ooey gooey Sweetened Condensed Milk, coconut, chopped walnuts and dark chocolate chips. 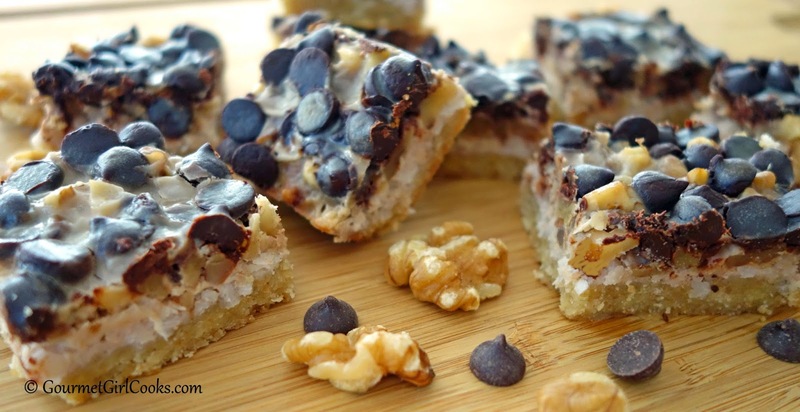 What they don't have is the boatload of sugar, carbs and wheat found in the traditional recipe for these delicious classic bar cookies. I went ahead and cut them up this morning and had one as my "lunch" this afternoon. I baked them in a 9" x 9" pan and cut them into small squares. I actually made about 25 small bars. Believe it or not, without the massive sugar surge that accompanies consuming the regular version, a small bar is plenty enough for me to enjoy. If you absolutely must, 2 small bars are more than enough to satisfy. I snapped a few photos below as well as included my easy peasy recipe. These bars feature my Sweetened Condensed Milk (recipe below) made with full fat canned coconut milk and confectioners style Swerve. I always make a double batch using 2 cans of coconut milk because it doesn't take you any longer to make, and trust me, you are going to WANT to have extra leftover to make another treat or two with. Check out the photos to see all the yumminess below. Enjoy! In a medium bowl, combine almond flour, flax, Swerve, cinnamon, diced butter and 1 egg. Using a pastry/dough cutter, cut butter and egg into flour mixture until a thick, dense dough forms. Using your hands or a rubber spatula, press dough evenly into an 8x8" or 9x9" nonstick baking pan. Bake crust at 325 degrees for 12 minutes or until very lightly browned. Remove crust and let cool for 10-15 minutes. 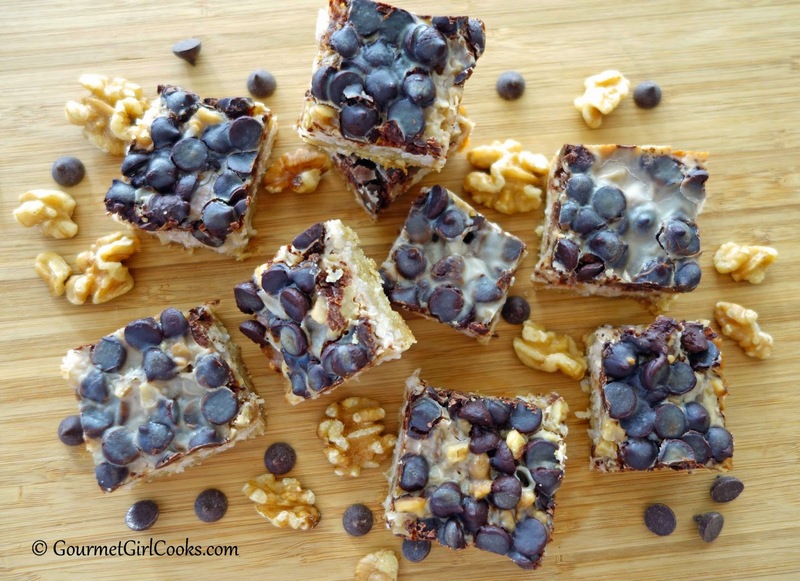 Increase oven temperature to 350 degrees F. Layer walnuts, coconut, and chocolate chips on top of crust. Drizzle evenly with 1 cup of sweetened condensed coconut milk. Bake at 350 degrees for 18 to 22 minutes or until lightly golden on top. Let cool completely and cut into bars. To make the Sweetened Condensed Coconut Milk, add coconut milk to a small heavy saucepan and stir in Swerve or sweetener of choice, butter and vanilla. Bring to a boil over medium-high heat. After milk comes to a boil, reduce heat to low-medium and simmer, stirring and whisking frequently for about 45 minutes until reduced by almost half. If a thicker condensed milk is desired, whisk in 3 to 4 pinches of xanthum gum (1/8 to 1/4 teaspoon), at the end of reduction; heating and whisking in a little at a time until thickened (I add 3 pinches to mine). Taste for sweetness. If additional sweetness is desired, add liquid stevia until desired sweetness is achieved (I add 1 to 2 teaspoons liquid NOW Better Stevia after reduction). Makes approximately 2-1/2 cups of sweetened condensed coconut milk. Cool before using in recipes. Refrigerate any unused portion. 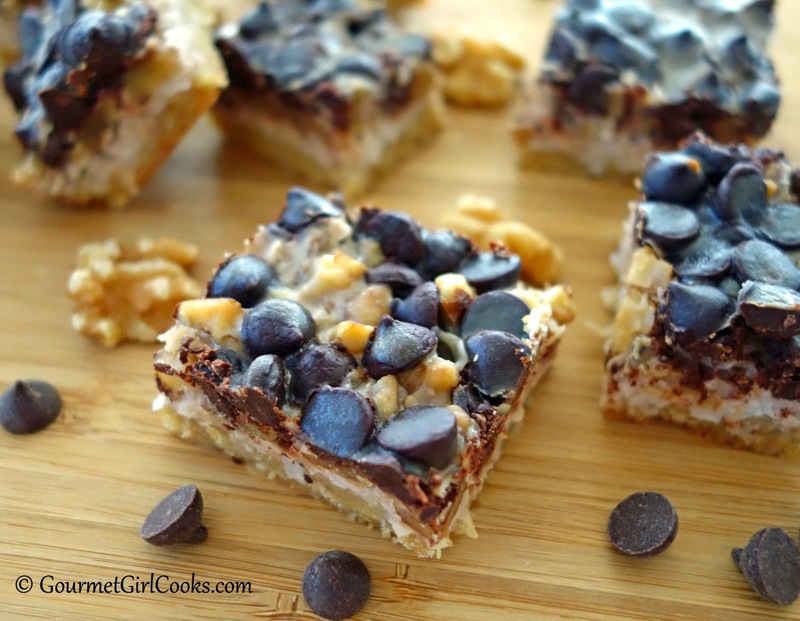 *Note: The Magical Cookie Bar recipe only uses 1 cup of the sweetened condensed milk; refrigerate any leftover condensed milk). Hi GG, I'm going to try this recipe of yours next. Can you tell me what brand of shredded coconut you are using? I can't seem to find any that are the longer shreds. Thanks for all the wonderful recipes! Would almond milk work to make the condensed milk?